Captain Charlie Donilon of Snappa Charters, Point Judith, RI, has been taking customers shark diving in a cage (one shown in photo) since 1976, longer than anyone else in Rhode Island. Ever since I visited Captain Charlie Donilon at his South County, RI home I felt I had to get this story out, his story, one that has been told by others in the past. He has been been televised on National Geographic Explorer, NESN and Chronicle. Feature articles have written about him in the Providence Journal, Wall St. Journal, Boston Globe, Yankee Magazine, Rodale’s Scuba Diving, RI Monthly, and On the Water to name a few. Every now and then you meet a great fisherman… a great charter captain… or a great person. 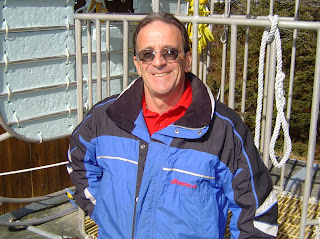 Captain Charlie Donilon of Snappa Charters, Point Judith, RI is all three. He runs the most diversified charter business in Rhode Island. He takes people on harbor and lighthouse tours, shark cage diving , bird watching, underwater photography charters, ash burials at sea, wreck diving, whale watching , fishing of all types and just about anything else you want him too. “That’s why they call it a charter service and not a fishing service. You have to be diversified to make the business work.” said Donilon. Capt. Donilon said, “I can remember I had six guys on board one day. They were all excited about shark fishing. They all wanted to kill a shark.” But, one by one, Capt. Donilon talked them out of it. He convinced them that they should tag and release as it was a great contribution to science and the sharks. Snappa Fishing & Diving Charters has been involved in the business of sport fishing for the past 40 years, their web address is http://www.snappacharters.com/ . Fluke (summer flounder) fishing tips and fluke cooking tips will be featured at the Monday, February 27, 7:00 p.m. Rhode Island Saltwater Anglers Association (RISAA) meeting this month. Capt. Dave Monti of No Fluke Fishing charters and noted local fishing columnist will share fluke fishing tips from expert guides, charter captains and anglers. Chef Dean Scanlon, owner of L’attitude Restaurant, Cranston, RI will share tips on how to care for your fluke from the moment you catch it so that it is a safe and delicious meal once you get it home. Dean is a chef and a fisherman, he and Maria Scanlon started their restaurant 11 years ago. RISAA members can bring a friend at no charge; non-members are asked to make a $10 donation. Seminar starts at 7:00 p.m. at the West Valley Inn, West Warwick, RI with optional dinner starting at 5:30 p.m. Visit http://www.risaa.org/ for details. Tommy Pelto of Tiverton, RI with one of the menhaden he snagged in the Providence River last week. Warm water has encouraged bait fish to stay in Rhode Island waters in larger numbers than normal this year. Dolphins in Narragansett Bay like these seen off Jamestown, RI in the fall two years ago were rare. This year many dolphin sightings were reported. 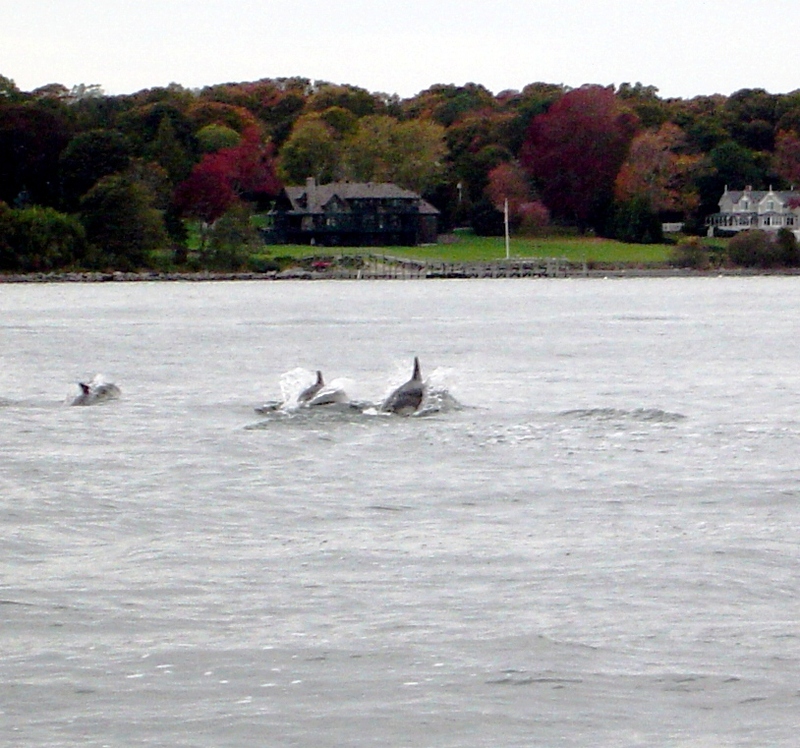 Warm water has caused bait fish, tuna, striped bass and dolphins to be around in large numbers this year. “I sat there on Beavertail Point, Jamestown with a pair of binoculars looking toward Narragansett Beach. What I saw was astounding, fish after fish, bluefin tuna jumping, one here, and then two over there.” said Captain Jim White. The odd thing is that it was the end of January, 2012. With many documented reports of tuna, menhaden, and striped bass in Narragansett Bay this winter it made me wonder why. The answer seemed obvious... the weather and the water temperature has been warmer than normal. In fact the Bay temperature has been heating up for nearly forty years, but this is a lot warmer than usual. How warm you ask? Well it used to be very cold. In 1740 Rhode Island Governor William Green of Warwick said in a note “… the Narragansett Bay was soon frozen over, and the people passed and repassed from Providence to Newport on the ice, and from Newport to Bristol”(Upkike, 1907). The crew of the Brenton Reef lightship measured water temperature at the mouth of Narragansett Bay every day from July 1878 through January 1942. In the coldest winter recorded (1917-18) the water temperature from December through February was 33.2 F. The average for the whole period of their record (64 years) is much warmer at 39.1 F. (Nixon, Granger and Buckley, The Warming of Narragansett Bay, 2003). However, even this temperature of 39.1 F is far from the warmer water temperatures recorded this Sunday, February 12, 2012… Conimicut Point, 45 F; Newport, 42 F; and Block Island, 46 F.
I mentioned Newport and Jamestown as this is where bluefin tuna have been crashing schools of herring this winter and a number of dolphins have been spotted off these shores and further into the Bay. 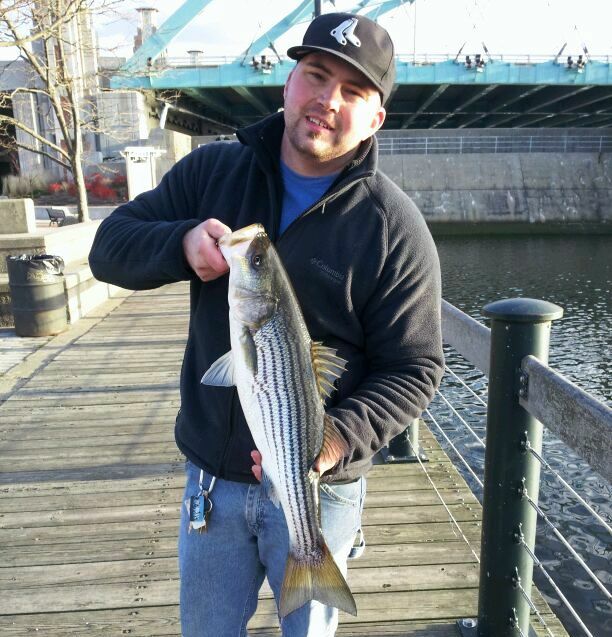 And, I mention Conimicut Light because from the Light all the way up the Providence River schools of Atlantic Menhaden have been around all winter along with an unusually large amount of striped bass that recreational anglers have been catching. This week I asked Jason McNamee, marine biologist, Marine Fisheries Division of the RI Department of Environmental Management his thoughts on the appearance of menhaden, striped bass, tuna and warm water this winter and here is what he had to say. I have to wonder what this might mean for fishing this spring and summer. There is no doubt we can start to fish earlier in the upper portion of the Bay as we can continue to fish the bass that have decided to stay as anglers have done all winter. Also, one might think that our coastal waters, the Bay and estuaries that are holding more bait than usually for this time of year would attract new migrating striped bass more than usual too. We will just have to wait and see. However, I am also interested in what effect this warm winter water might have on the fish in the summer. We know warm water, excessive nutrients and low oxygen levels have had devastating effects (fish kills) in the summer in the upper portions of the Bay, particularly Greenwich Bay and Cove (see Fish need oxygen too at http://noflukefishing.blogspot.com/2011/07/fish-need-oxyen-too.html ). Again, we will just have to wait and see. Wednesday, February 22, Public Hearing. 6:00 p.m., URI Bay Campus, Corless Auditorium. Agenda to include proposed changes to the Management Plans for most salt water species including fluke, striped bass, tautog, menhaden, scup and more. Two topics, fluke (summer flounder) fishing tips and fluke cooking tips will be featured at the Monday, February 27, 7:00 p.m. Rhode Island Saltwater Anglers Association (RISAA) meeting this month. Capt. Dave Monti of No Fluke Fishing charters and noted local fishing columnist will share fluke fishing tips from expert guides, charter captains and anglers. Chef Ralph Battista, owner of Luigi’s Restaurant and Gourmet Express, Johnston, RI will share fluke cooking tips. When not cooking at his restaurant Ralph spends time with his family aboard his boat Hook’n & Cook’n. RISAA members can bring a friend at no charge; non-members are asked to make a $10 donation. Seminar starts at 7:00 p.m. at the West Valley Inn, West Warwick, RI with optional dinner starting at 5:30 p.m. Visit www.risaa.org for details. You might say, “I just use this rig for school bass, the small ones, so the line is fine.” However, you can’t pick the time when a big fish hits. So make sure your gear is in good working order at the start of the season and throughout the year. The experts suggest checking all reels, rods and line before the season starts and do regular maintenance throughout the season. Replace line, repair line guides on rods and perform reel maintenance twice a season if necessary, particularly on those rigs that get a lot of action. So, to make sure I do not lose a big fish, I perform the following maintenance routine before the season starts. To paraphrase Vince Lombardi the great football coach who said football games are won in the summer when training is done… big fish are caught in the winter when proper maintenance is done. George Poveromo, host of George Poveromo’s World of Saltwater Fishing said, “As a rule of thumb, a reel should be brought to an authorized reel center at least once a year.” And, with reels that get a lot of action, perhaps twice a year. Give your reels a good cleaning, particularly when the line is off. Grease where directed by manufacturer, often times, the reel is marked where to do this. If instructions are long gone do not hesitate to stop by your local bait or tackle shop to ask where to grease. Do not grease the drag, it is not meant to be greased, if you do, it will not work. John Littlefield of Archie’s Bait & Tackle, Riverside, RI, said, “Anglers often forget to put oil on the line guide worm gear on bait caster reels as this is can go a long way allowing the gear to perform properly throughout its lifetime.” It costs about $10 to $15 to clean and grease your average spinning reel. Check the RISAA website at www.risaa.org for member bait and tackle shops that repair reels, many of them appear on the member discount landing page. Each year, replace used line. This is a judgment call as to what is meant by “used”. The braid line I spooled on two rigs at the end of the season is still ok, however, I took line off at the beginning of the reel that was showing signs of wear. Experts say a to cross braid line when spooling onto conventional reels to prevent the line from digging into the spool when a big fish is on. Another tip is to re-spool lead line putting the used portion on the reel first, this way you use line that is new as most anglers rarely use more than three to four colors (90’ to 120’) of line. Replace all the monofilament line on reels at the start of the season. Monofilament line has memory so it tangles easily and creates bird nest tangles when it is old or has been sitting in the cold for a while. Also stretch the line, the first 100 feet (of monofilament line) to relax its memory and avoid tangles. When you change any type of line it is important to spool tight or the line may slip on the spool. Examine the rods for cracks and stress marks. Closely examine the eyes for chips or cuts that could cause line to snag, rub or break. Do not place hooks on the eyes or they will eventually create cracks that will cut line as it passes through. Place all baits at the base of the reel as those hooked to an eye brace will bang on the rod and may cause microscopic cracks in the rod blank that could lead to a broken rod.. I get tackle ready in chronological order when certain species are fished… starting with tautog, striped bass, blue fish, fluke, sea bass, etc. I then go through tautog rigs first, then the striped bass, etc. Make sure you have enough rigs to fish the species. Hooks should be clean and sharp (no rust), and strong enough for the size fish you are going after. Often hooks that come with lures are not quality hooks so I replace them with stronger hooks. Use wire leaders for blue fish and monofilament or fluorocarbon for striped bass, fluke, sea bass, etc. Blues won’t bite though the wire and other species will find it harder to see the monofilament or fluorocarbon leaders. As a rule I replace all used leaders at the beginning of the season. During the season make sure leaders have no nicks or stress marks from fish pulling. If they do, replace them. I switched most of my hooks to circle hooks, I did this so I can safely catch and release undersized or unwanted fish (particularly striped bass). Circle hooks are designed to hook the fish at the corner of the mouth and not down in the belly. All hooks should be sharp and rust free. 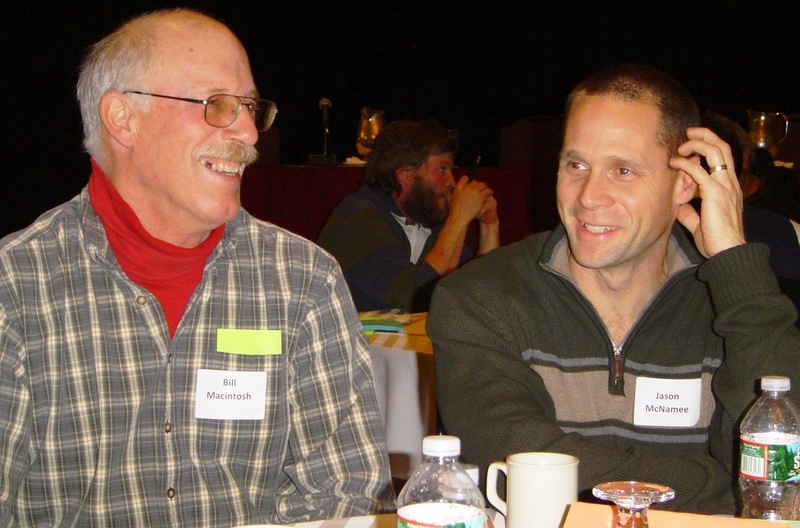 Fish talk: Bill Macintosh, fisherman and a member of the Rhode Island Marine Fisheries Council, and Jason McNamee, marine biologist for the Marine Fisheries Division of DEM, talk about fishing regulations at the Commercial Fluke Symposium held at the Crowne Plaza, Warwick, RI. Fish scientists present the facts on fluke (summer flounder) in Rhode Island at the Fluke Symposium last week at the Crowne Plaza, Warwick, RI. 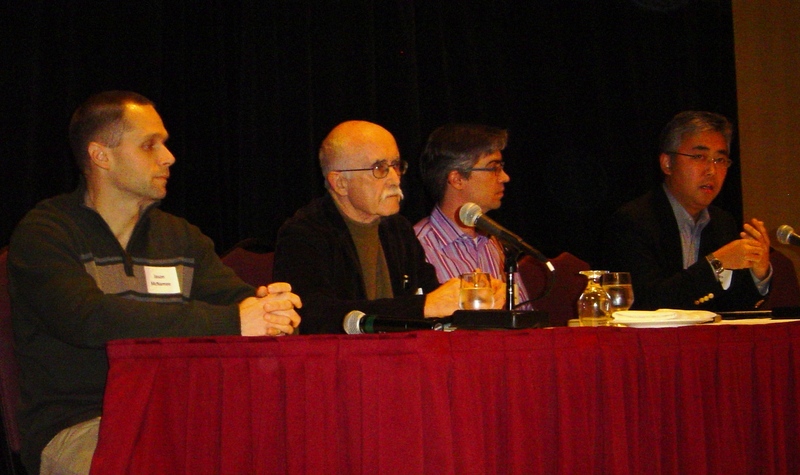 From the left: Jason McNamee, marine biologist for the Marine Fisheries Division of DEM; Dr. Richard Pollnac, marine affairs, University of Rhode Island; Dr. Chris Anderson, environmental and natural resource economics, University of Washington; and Dr. Hirotsugu Uchida, environmental and resource economics, University of Rhode Island. 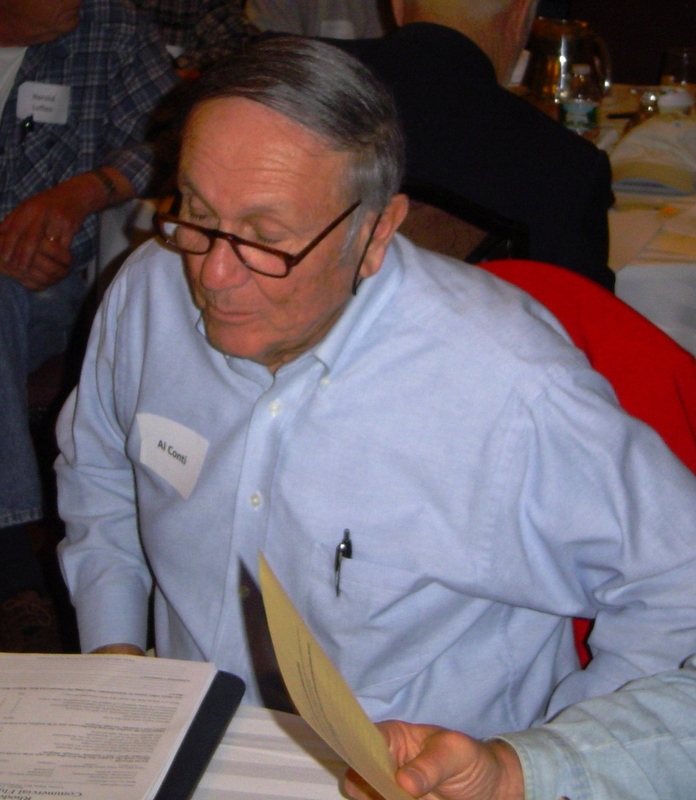 Al Conti, owner of Snug Harbor Marina, South Kingstown, RI prepares his notes before presenting at the Fluke Symposium. So imagine you are a fish manager. Your job is to manage the fish resource. If fish are plentiful and regulations are too tight the resource may be over regulated as the resource is not being used at its maximum sustainable level. This makes fishermen furious. And understandably so, because this is the way they make a living. Often times, it is the way their father, uncles and grandfathers made their living too. On the flip side, if a species is overfished, if they are on the decline or beyond sustainable levels you are in real trouble. There may be too many boats fishing for too few fish or the science/data you were given to calculate the number of fish that can be taken was bad. It is likely a combination of reasons why the species is on the decline, and you just have to figure it out because fishermen, the community and most of all, the fish resource itself, are counting on you. Managing fish is a difficult job and often times a thankless job. However, I am happy to relate that here in Rhode Island we are in good hands. The Rhode Island Department of Environmental Management (DEM) led by Janet Coit, director, and her dedicated Marine Fisheries Divisions team along with the help of marine scientist at the University of Rhode Island (URI) do a good job of managing our fish resources here in Rhode Island. The complexity of fisheries management and the professionalism of our fish managers were evident this past Friday, January 27 at the RI Commercial Fluke Symposium held at the Crown Plaza in Warwick, RI. The day-long symposium tackled the issue of commercially harvested summer flounder (or fluke) and the fisheries capacity to provide long-term, sustainable harvest opportunities. The Symposium was sponsored by URI in collaboration with the RI DEM and the Rhode Island commercial fishing community. So this means there were fishermen, fish scientists and fish managers/regulators all in the same room, talking about a very controversial topic… how to manage commercially harvested fluke or summer flounder. The objective of the Symposium was to examine the RI fluke fishery… share and discuss what is known based on recent research and experiences of participants, share and discuss issues and perspectives regarding fisheries outside RI that are subject to quota based management programs, and identify and evaluate options for managing the RI commercial fluke fishery in 2012 and beyond. One quota based management experiment reported on at the Symposium was the RI Fluke Sector Pilot program. The report drew a comparison between the fishing effort and results of vessels fishing in the experimental RI Fluke Sector Pilot with the effort and results of non-sector vessels. What made the symposium timely is that the RI Fluke Sector Pilot completed its third year a month ago and State fish regulators must decide on whether or not to allow it to continue in some form. With the Pilot program, annual catch limits were put into place to prevent overfishing and to rebuild stocks rather than a limit on the amount of time (often days) spent fishing. The idea was to allow fishermen the option of controlling fishing effort. Fishermen in the pilot sector fished an allocated share of the total allowed catch where as non-sector fishermen fished individually with a limit on the amount of fish and time spent fishing. Fishing in groups with a total allowable catch offers fishermen flexibility to fish when market prices are highest or fish for species when they are available and other species are not. Jason McNamee, marine biologist for RI DEM, shared the performance of Pilot sector boats compared to non-sector boats. The results were clear. The Pilot project was a success. Fish discards (of undersized fish) from Pilot sector boats was about three to four pounds verses thirty pounds for non-sector boats. Additionally, sector boats did not decrease the results of fishing effort of non-sector boats, but actually increased it allowing all vessels to get more for their catch because the market was not flooded with too many fish of the same species at the same time. So the sector proved to be an effective way to sustain the resource, enhance fisheries and reduce discards to record low levels. Unwanted fish (due to size or species) are called discards. Many of them either die when they are dragged through the water or are injured and will likely die when put back in the water. The RI Pilot Fluke Sector grew over its three year history; new members were added as fishermen saw the benefits of flexibility. A highlight at the symposium was a paper presented by Chris Anderson, a professor of environmental and natural resource economics at the University of Rhode Island when he published the paper in April, 2011. Chris is now at the University of Washington. Chris said, "...the (RI Pilot) sector shifted fluke landings to times when they could maximize price. Comparing revenues… we find the sector program increased fleet wide (twelve boats in the fleet at this time) revenues over $800,000, including benefits of over $250,000 to non-sector vessels.” So the pilot sector enhanced revenue for its twelve members, but also incurred enhanced revenue for non-sector vessels by spreading available fish over an extended amount of time rather that flooding the market all at one time which reduces their market value. Both Dr. Anderson and Jason McNamee shared that the Fluke Pilot program also had a positive impact on fishing for other species in that when Pilot boats fished for fluke, non-sector boats were fishing for other species, reportedly getting higher prices for these fish too because there were not as many of these fish on the market at the same time. Fishermen at the symposium that were in the RI Fluke Sector Pilot related their desire to continue to be managed or regulated in this manner as it proved to be a highly successful way for them to fish. The input obtained at the Symposium will be used by Janet Coit, DEM director and her department to develop proposals and regulations for the 2012 commercial fluke fishery. We should know what direction regulation proposals are going in within the next six to eight weeks. OK, so most recreational saltwater fishing regulations have not been established at press time, however, we do have a good idea of what they might be. Rhode Island Marine Fisheries Council (RIMFC) species Advisory Panels (AP) review stock assessments, past fishing activity, regulation options and solicit public comment on proposals. Some of these panels have met and others have not. But thanks to Jason McNamee, marine biologist for the Marine Fisheries Division and his associates at the Department of Environmental Management (DEM), we have a good idea of what fishing regulations will ultimately be in for 2012. I interviewed Jason at press time; here is a summary of what we can expect for 2012 recreational regulations. Summer flounder (fluke) recruitment stock assessments used by the Atlantic States Marine Fishery Commission (ASMFC) offered conflicting information last year. The June recruitment was at 80 million fish, and the August was 60 million. Jason McNamee said, “The conflicting data would have created a need for a 2012 adjustment. However, recreational fishing experienced an under harvest in 2011.” The under harvest was so great that even with lower recruitment we may still experience a liberalization in recreational fluke regulations this year. The 2011 regulations included an 18.5” minimum length with a May 1 to December 31 season and seven fish/person/day. An increase to eight or nine fish will be explored, vetted both at the January 31st AP meeting and the February 22nd public hearing. So overall we have good news for fluke in 2012… status quo or a slight liberalization. Black sea bass are regulated both the ASMFC and States. At a recent ASMFC public hearing, species management plan options discussed included managing the species state by state or by two different regional options. The Rhode Island black sea bass AP discussed these options on January 19th and sentiment came down on the side of the state by state option. Stock assessments have been good so an early season start might be in order along with an increased bag limit of one or two fish. So 2012 regulations are likely to be liberalized with the season starting July 1st, rather than July 11th as it was last year, and run through December 31. The 13” minimum size will likely stay the same with an enhanced possession limit from 12 fish/person/day to possibly 13 or 14 fish/person/day. The Scup stock assessment is good and the species was under fished in 2011, “Recreational landings were about one half of what was allowed.” said McNamee. The species is managed regionally with CT, NY, MA and RI. The RI season was extended to December 31st last year and this is likely to occur again in 2012. Additionally, there will likely be a liberalization in the number of fish allowed. In 2011 the minimum size for the private angler was 10.5” with a 10 fish/person/day bag limit. However, for party and charter boats the minimum size was 11” with a special season possession limit that jumped from 10 fish to 40 fish/person/day from September 7 to October 11. The enhanced bag limit allows charter and party boats to fish the species when other fish are not as available, yet they have to catch fish at least 11”. McNamee said, “There was some sentiment at the AP meeting to make the season onsistent with one set of regulations meaning a 10.5” fish for party and charter boasts as well as private anglers with a 25 fish bag limit.” This proposed change would likely receive some push back from the charter and party boat industry as they rely on the enhanced bag limit to allow their businesses to function when other species are not aggressively fished. Overall, it is good news for recreational anglers targeting scup in 2012, the season will likely be lengthened and the bag limit may be enhanced. Tautog harvest numbers were low in 2011, however the assessment does not include “Wave 6” which in November and December. 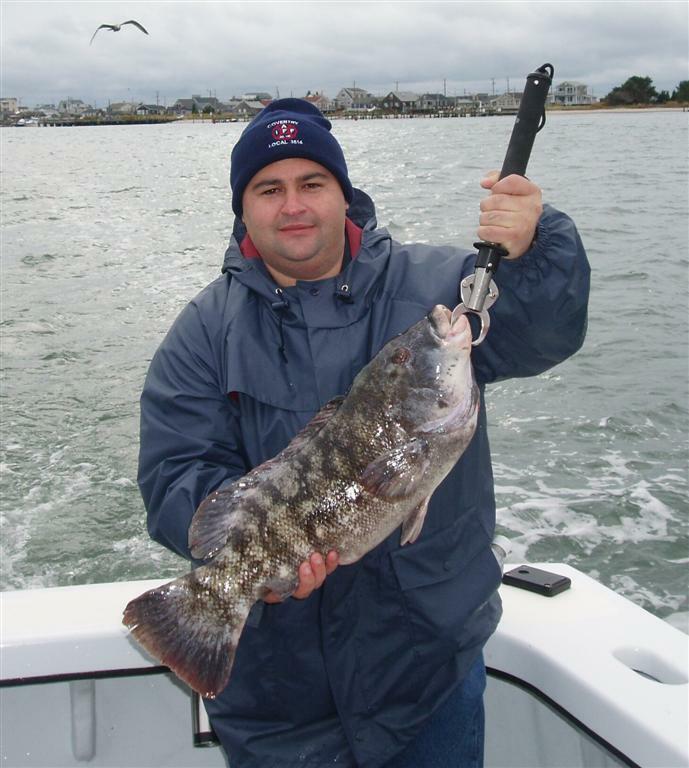 The tautog AP will meet February 6. Liberalization will likely not occur in 2012, regulations will likely be status quo. Split seasons with a 16” minimum size. An April 15 to May 31 spring season with three fish/person/day, a closed season June 1 to July 31 and then a three fish/person/day season from August 1 to October 12. The bag limit increases to six fish from October 15 to December 15 with a ten fish per boat limit in all periods except for charter and party boats which do not have to adhere to the ten fish per boat limit. Menhaden. Jason McNamee said, “We believe recreational anglers were happy about how things worked out last year.” McNamee was referring to the closed sections of Narragansett Bay… Greenwich Bay and north of Conimicut Light were closed to commercial boats. When asked about the apparent abundance of menhaden in the West Passage of Narragansett Bay in the fall McNamee said he did not think new restrictions and enhanced weekly monitoring (with air surveillance to manage better) had an impact on the volume of fish in the Bay. However, McNamee said, “Perhaps the schools were not fished as often commercially and this kept them together. So less commercial fishing may have created an apparent enhanced volume of fish.” He continued to say that the impact of lower targets imposed by the ASMFC will hopefully be seen over the next few years and menhaden will be more plentiful along the east coast and in Narragansett Bay. Captain John Rainone says “Keep your tautog rig simple to avoid getting snagged on the bottom... one hook and a sinker.” and you might catch tautog like this one, caught by Matt Medeiros when fishing on Lil’ Toot Charters, Point Judith, RI. Last week we shared striped bass and tuna fishing tips from expert anglers and captains who appeared on stage with George Poveromo at the Saltwater Sportsman’s National Seminar Series. Here are some fluke and tautog tips from local and national experts. 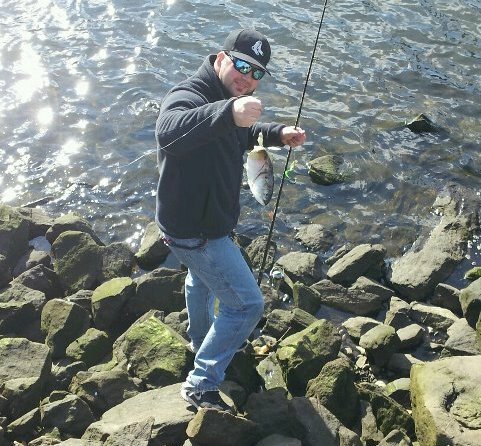 · Best place to catch fluke is where you normally fish for striped bass as they both like current, structure, squid, silversides, etc. Try fishing in your favorite striped bass spots and you are likely to catch fluke too. · In Spring, fluke tend to be in low water, they like feeding on sand eels. · Captain Rainone’s favorite places to fish for fluke include many spots around Block Island… the North Rip area, the northeast side of the Island as well as the south side. Other spots include Cow Cove, Clay Head and the mouth of New Harbor. Off the center wall at the Harbor of Refuge is a great spot too. 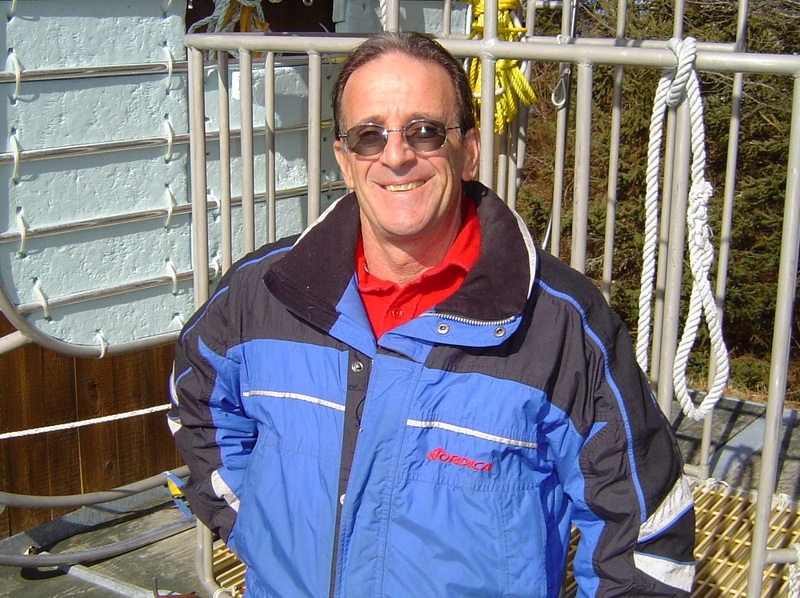 · George Poveromo said, blackfish often take advantage of the slower stages of a tide to feed. The slower stages of a tied also enable anglers to effectively fish difficult structures. · George Poveromo introduced a simple tautog rig designed to fit in-between structure and rocks… The “knocker-rig” can be used on a 30 pound braid main line with a fluorocarbon leader, an egg sinker (2 oz.) slides on the fluorocarbon that is tied to a circle hook. The sinker and the hook tangle less frequently because they work their way into structure together … and here is the best part… you can attract the fish by tapping on the structure with the sinker and bring it right to your bait… thus the name “Knocker-Rig”. Now is the time to let your voice be heard at important Rhode Island Marine Fisheries Council (RIMFC) meetings that impact recreational fishing. For more information on these meetings contact Jason McNamee, DEM Marine Fisheries Division at 401-423-1943. Meetings take place in the Hazard Room at the URI Coastal Institute (Bay Campus), South Ferry Road, Narragansett, RI. Wednesday, February 22, Public Hearing for input on policy/regulations for many species. Agenda to include proposed changes to the Management Plans for most species. Visit www.dem.ri.gov for agenda, meeting time and place. At press time, there were no “Safe Ice” postings on the Department of Environmental Management’s website regarding the three State Parks they monitor including Goddard, Lincoln Woods and Meshanticut State Parks. DEM says it takes five to seven days of temperatures in the low 20 degree range before ice may become safe. And, this is no guarantee that it is safe. Call your local city and town to check local ice conditions or DEM for the State Parks they monitor at 401.222. 2632. Visit DEM’s Parks website for an ice safety guide at www.riparks.com . Two topics will be featured at the Monday, January 30, 7:00 p.m. Rhode Island Saltwater Anglers Association (RISAA) meeting this month… the “Clean the Bay” organization will present on its activities in Narragansett Bay and a humorous view of Tarpon fishing will be given by Al “Gag” Gagliarducci, noted fishing lures maker and popular East Coast presenter. RISAA members can bring a friend at no charge; non-members are asked to make a $10 donation. Seminar starts at 7:00 p.m. at the West Valley Inn, West Warwick, RI with optional dinner starting at 5:30 p.m. Visit www.risaa.org for details. Answer: I responded to Paul’s e-mail this weekend… Yes, there were pair-trawlers off Narragansett this past week fishing for herring (we think). Bob Ballou from DEM’s Marine Fisheries Division was addressing the issue, exploring with his legal group what could be done short term, and long term DEM may explore regulating via legislation.